After being teased with snippets of 'Wonder Woman' yesterday, the full third trailer arrived Saturday night as promised. Gal Gadot and Chris Pine appeared on Nickelodeon' 'Kid's Choice Awards' to introduce a shortened version of the trailer followed by the full release on Gadot's twitter account. The newest and possibly last trailer before its June release features more background and action. Diana's mother Hippolyta is protective of the young princess but through her training discovers her powerful legacy. She joins the fight when Steve Trevor lands on her island and returns him to Britain and World War I. She is ready to defend the world if no one else is and much of the trailer is an epic montage of Wonder Woman wielding the God Killer sword and iconic lasso. Wonder Woman arrives on June 2, 2017. 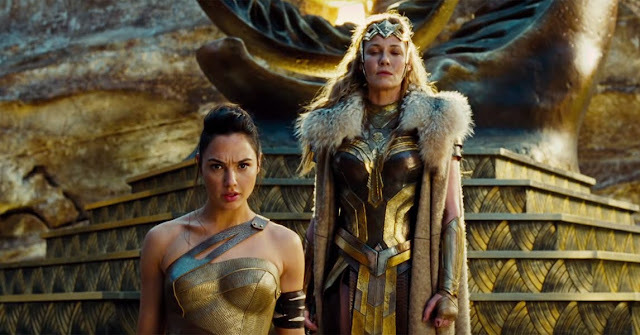 Wonder Woman” hits movie theaters around the world next summer when Gal Gadot returns as the title character in the epic action-adventure from director Patty Jenkins. Before she was Wonder Woman, she was Diana, princess of the Amazons, trained to be an unconquerable warrior. Raised on a sheltered island paradise, when an American pilot crashes on their shores and tells of a massive conflict raging in the outside world, Diana leaves her home, convinced she can stop the threat. Fighting alongside man in a war to end all wars, Diana will discover her full powers…and her true destiny.